something incredibly bad has just happened. these were the immortal words of dave chang when he accidentally deleted a couple of seconds of drums from scalpel and thread. we thought it was worth putting in. i mean, what does the end feel like? this line is from the movie spinal tap. not only is it entertaining, it also represents the fact that we had already split up by time we can to design the cover art for the album. wash me thoroughly from mine iniquity, and cleanse me from my sin, for i acknowledge my transgressions, and my sin is ever before me. behold, i was shapen in iniquity, and in sin did my mother conceive me. behold, thou desirest truth in the inward parts: and in the hidden part thou shalt make me to know, and i shall be whiter than snow. make me to wear joy and gladness, that the bones which thou hast broken may rejoice. hide thy face from my sin, and blot out all my iniquities. create in me a clean heart, o god, and wisdom. purge me with hysop and i shall be clean: wash me and renew a right spirit within me. the sacrifices of god are a broken spirit: a broken and contrite heart, o god, thou wilt not despise. chris played guitar on all songs, bass on track 7 and did back-up vocals on tracks 2, 3, 9 and 13.
frank did vocals on all songs, bass on all songs, computers on track 1 and the surah's, drums on track 7 and guitar on track 13.
ben played drums on all songs, did vocals on tracks 2, 3, 5, 7, 9, and 13, and played guitar on track 13.
we demo'd this entire album in the summer before we recorded it, using a 4-track tape in a basement in kings cross to do the instruments, and our school studio for the vocals. we did this to perfect the electronica on the record and to see how it felt as a whole. various cd's of this still exist. the album was the same, apart from 'how to make someone fall in love with you' which wasn't on there. we recorded at backstage studio's, run by dave chang, for 11 days in september 2000. the studio is in ripley somewhere up north. we stayed in a local caravan park, it was ace. dave chang has a website: www.davechang.co.uk. chris blake is a friend of the band who leant us his cymbals for the recording because ours were fucked (thanks, largely, to sam from abjure!). the cover was conceived and designed by all of us, and put together with the help of dave blanco (who we forgot to credit on the cd!). the handwriting is frank's. all the photos were taken by frank, apart from the photo of him and the one of ben, which were taken by sarah jones. the background photo for this page is some telegraph wires in hampshire. the cover shot is a boating pool in sheringham, norfolk. 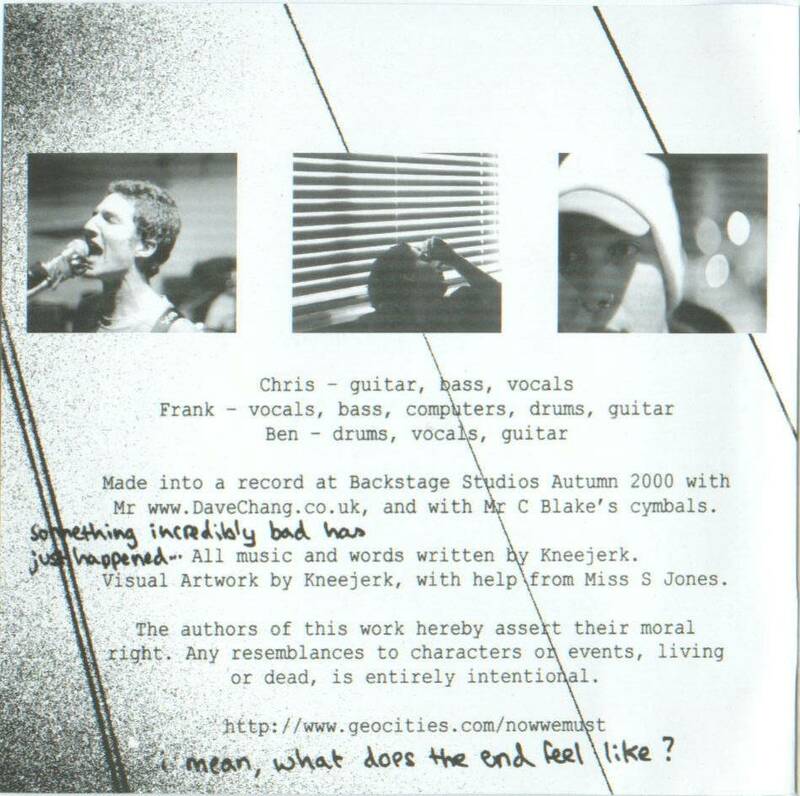 the picture under the tray of the cd is chris dying his hair black before our mini-tour with symbiosis in early 2000.
the little bit at the end of this page is a stupid joke. the album was recorded and mastered in september 2000. we played our last show in nottingham in october of that year. the cover was finished by the end of 2000, and the record was eventually released on sakari empire records in february 2001, on a print run of 500, pretty much all of which have now been passed on.